Filmmaker Karan Johar unveiled his wax statue at Madame Tussauds Singapore early today. He was accompanied by his mother Hiroo Johar at the museum. Not only this, but he also inaugurated a new area in the wax museum which is dedicated to Indian cinema. The director was seen posing with the wax statue that holds a mobile in its hand, allowing you to take selfies with it. Karan joins celebs such as Anushka Sharma, Oprah Winfrey, Lewis Hamilton and Cristiano Ronaldo in having a statue with interactive features. 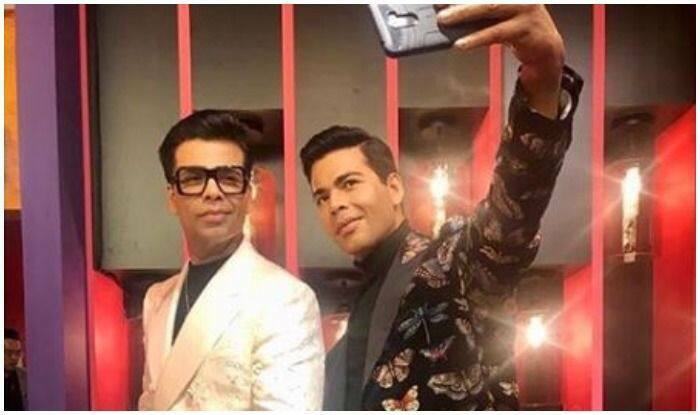 Karan becomes the first Indian filmmaker to get a wax statue at Madame Tussauds. Karan took to Instagram to share a few pictures from Madame Tussauds Singapore. He captioned it as, “WAXED!!! At @mtssingapore #madametussauds !! What fun with my mom @hiroojoharand my family!!!!! @anushkaskhanna@priyankaskhanna #masi #payal and my surprise from friends who are too shy to be named!!!❤️❤️❤️”. He is seen wearing an all-white ensemble by Dolce & Gabbana. Karan Johar missed Kalank’s trailer launch because he was in Singapore to unveil his wax statue. People are loving the trailer and are excited for the film t get release.